Cattle muster on Molesworth Station. Stockmen, horses and dogs, pushing 400 steaming cattle towards Lake McRae (left) down Driving Spur on Autumn muster over Robinson Saddle. Tweed River. Panorama, Molesworth Station, Marlborough District, Marlborough Region, New Zealand (NZ) stock photo image from New Zealand (NZ). Cattle muster on Molesworth Station. Stockmen, horses and dogs, pushing 400 steaming cattle towards Lake McRae (left) down Driving Spur on Autumn muster over Robinson Saddle. Tweed River. 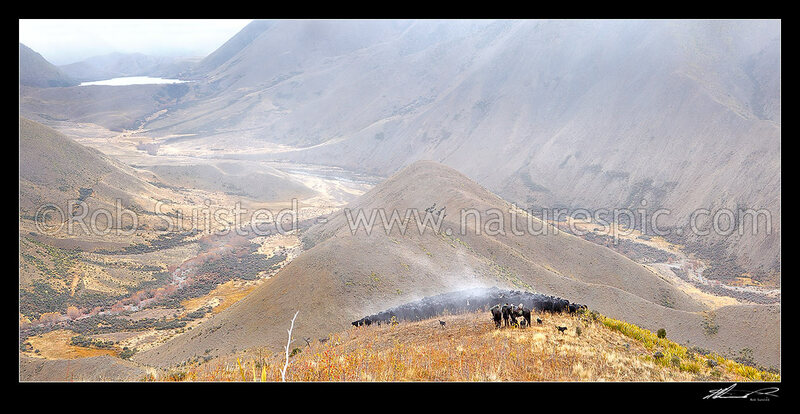 Panorama, Molesworth Station, Marlborough District, Marlborough Region, New Zealand (NZ) stock photo image (Picture ID #: 46230GL00).